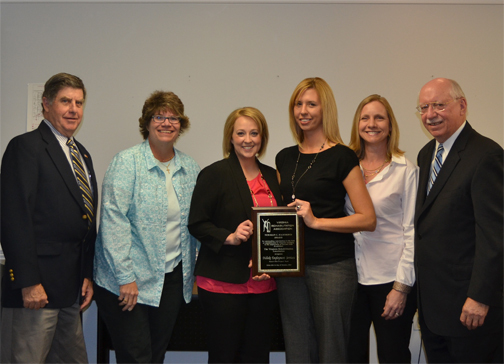 The Norman C. Hammond Award is displayed by (from left to right) Richard Ratcliffe, Didlake Chairman of the Board; Lisa Malone, employment specialist; Stacy Hart, employment specialist; Christy Stegman, program manager; Rebecca Paté-Johnson, program manager; and Rex Parr, Didlake president and CEO. Manassas, VA – Didlake has received the Virginia Rehabilitation Association’s Norman C. Hammond Award for its pilot project using iPod Touch technology. The program put iPod Touch devices in the hands of people with disabilities to help prepare them for job interviews and as a training tool on the job. Didlake was nominated by the Virginia Department for Aging and Rehabilitative Services. According to VRA, the Norman C. Hammond Award was established to honor business and industry leaders whose contributions to the field of rehabilitation in Virginia are outstanding and result in the employment of persons with disabilities.